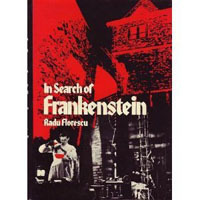 After his book In Search of Dracula with Raymond McNally, Boston College professor Radu Florescu wrote the similarly themed, if more entertaining In Search of Frankenstein about Mary Shelley, her travels through Europe, the process of writing Frankenstein (1818), and her possible inspirations. Unlike In Search of Dracula, Florescu’s next book is a more streamlined affair, giving nearly equal attention to each subject he covers. Thanks to some original research, it is likely that even seasoned Frankenstein and Shelley fans will find something new here. Plus, it is ideal Halloween reading: fun, quick, interesting, and spooky. Florescu begins with discussing Mary’s early life and the impact of her mother, feminist writer Mary Wollstonecraft and her death early in Shelley’s life. He also discusses her complicated relationship with poet Percy Shelley and involvement in his literary circle, which included Lord Byron, his physician John Polidori, and Mary’s half sister Claire Clairmount. Of key importance is obviously the trip the Shelleys took with Lord Byron to the Villa Diodati by Lake Geneva. During one dark and stormy night, they dared each other to write scary stories, which resulted in a number of tales and inspired Mary to write the most enduring of all, Frankenstein. 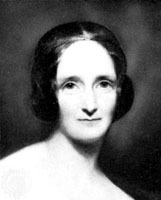 Florescu also examines Mary’s lengthy trip through Europe with Percy Shelley and their possible visit to a German castle near Darmstadt actually called Castle Frankenstein. Here an infamous alchemist, Konrad Dippel, allegedly experimented on human bodies, supposedly attempting to transfer souls between them. He also claimed to have invented an elixir to grant eternal life. Emmanuelle Swedenborg, once a supporter, called him a “vile devil” for reports of heresy against Dippel. Florescu believed it was undeniable that Mary was influenced by Dippel’s history and legend. Though this hasn’t been corroborated by much academic proof, it is still a fun read and something worthy of consideration. There is proof that she did visit the area, but she didn’t mention the castle specifically in her journals. There is also a chapter entitled “The Artificial Man,” which covers other possible sources of inspiration outside of Dippel, namely men who experimented with electricity, early forms of human and animal dissection, etc. In closing, he discusses the process of writing and publishing Frankenstein, which did not have Shelley’s name on it until the second edition. There is a very nice filmography that lists Frankenstein adaptations up through the ‘70s (somewhat hilariously ending with Mel Brooks’ spoof Young Frankenstein). Unlike In Search of Dracula, there is not an extensive bibliography or series of quotations, which somewhat hurts Florescu’s claims that his theories are scholarly, rather than the product of fantasy. Though Florescu doesn’t cover a whole lot of new material – outside of Dippel and Castle Frankenstein – In Search of Frankenstein is a great starting place for those interested in Shelley’s life and the origins of Frankenstein. As I mentioned, it is a quick and entertaining read and serves as a good introduction to Mary Shelley and her famous, enduring, and monstrous creation. If you want to know even more about Mary Shelley and Frankenstein, check out The Cambridge Companion to Mary Shelley, the Norton Critical edition of Frankenstein, E.J. Clery’s Women’s Gothic: From Clara Reeve to Mary Shelley, Anne K. Mellor’s Mary Shelley: Her Life, Her Fiction, Her Monsters, and The Lady and Her Monsters by Roseanne Montillo. There are, of course, many more volumes. David J. Skal also has an interesting book about the development of mad scientists in modern culture, Screams of Reason.